Nicholas Lunn has thoroughly shaken my views concerning the ending of the Gospel of Mark. As in the case of most gospel scholars, I have for my whole career held that Mark 16:9-20, the so-called 'Long Ending,' was not original. But in his well-researched and carefully argued book, Lunn succeeds in showing just how flimsy that position really is. The evidence for the early existence of this ending, if not for its originality, is extensive and quite credible. I will not be surprised if Lunn reverses scholarly opinion on this important question. I urge scholars not to dismiss his arguments without carefully considering this excellent book. 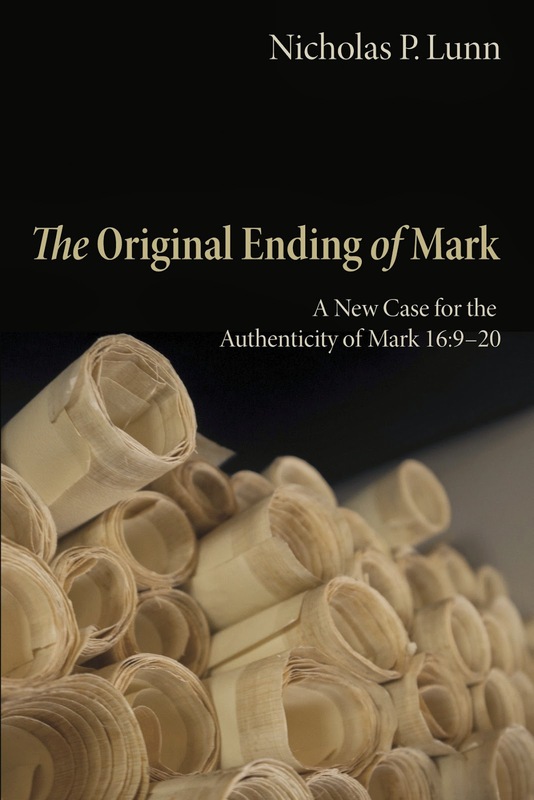 The Original Ending of Mark is must reading for all concerned with the gospels and early tradition concerned with the resurrection story. I'm sure that this book is a fresh air in an academy world dominated by Alexandrian textual criticism. I remembered that there is another new book in defense of 1 John 5.7 (http://www.amazon.com/In-Defense-Authenticity-Of-John/dp/1615077669). I didn't read yet, but seems in the preview that is a synthesis of scholarly arguments(e.g. E. F. Hills and others) in defense of the Johannine Comma in a popular way. What is interesting is that his author is greek. I think that is a important point in the exegesis of this passage. God bless you, brother Jeff! Thanks for the encouragement brother. I have written a review of the Pappas book on the CJ. Hopefully, it will appear soon in Puritan Reformed Journal. Maybe I can also post it here later. Jeff, You've misspelled his name as "Lund" in more than one place. It appears it's "Lunn," no? But thank you for this! Keith Mathison is also maybe coming around: "This may have been the most surprising book I read in 2015. My thoughts on the ending of Mark have been basically settled for over 20 years. I have long been convinced that the original ending of Mark was at 16:8. Lunn’s book has caused me to go back and take another look at the evidence and seriously reconsider my position. He provides a very thorough and helpful examination of the external and internal evidence. His consideration of the linguistic argument is particularly good. In my opinion, Lunn’s book demonstrates that the case for the longer ending of Mark is a lot stronger than many of us have been led to believe, and he certainly demonstrates that the case for the shorter ending is a lot weaker. It will be interesting to see whether his work re-opens the debate and changes any minds." Thanks Hugh. I either wrote this post too late, too quickly, or both. Corrected. Thanks also for the Mathison blurb. Interesting.